Medicare Milestones are four-page "newsletters" that present your clients with only the most crucial information related single Medicare subject, such as Medicare Part D drug coverage or the three Parts (A, B, D) of Medicare, etc. Whenever possible, this information is presented using visuals — charts, graphics, bullet lists, etc. — to keep client interested and engaged. But how should you use the Medicare Milestones to best effect? Here are some suggestions for use. Determine a schedule of clients that will turn 65 over the next 12 month period. Happy 64th Birthday! Just know that Medicare is on the horizon now and we've got your back. Whenever you're ready to learn more about your Medicare decisions, just give us a call. We can help you make the best decisions for your unique needs. In the mean time, happy birthday and happy reading! Any day now, you'll begin receiving a flood of Medicare-related marketing materials. When this happens (if it hasn't already), we can help you! Make an appointment now to get the expert, unbiased enrollment guidance you need to make the best Medicare decisions. It's time to begin making important Medicare enrollment decisions. Give us a call or use this appointment card to schedule a time that's convenient for you to go over your Medicare needs. Please don't delay. We can help you avoid costly and potentially permanent Medicare mistakes. 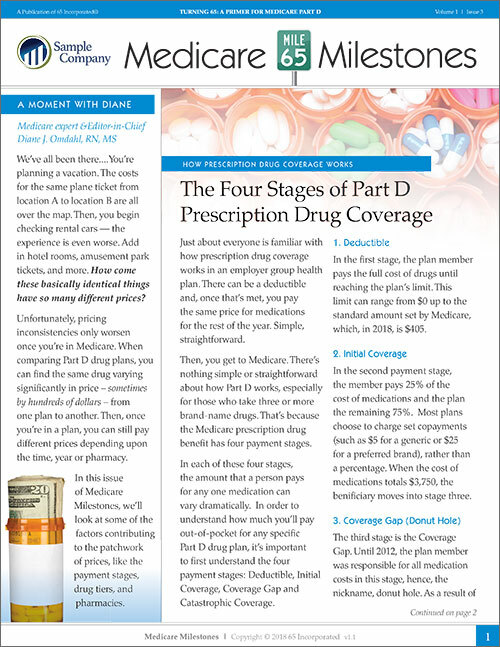 In the month of September of each year, send any clients over the age of 65 the Medicare Open Enrollment issue (See illustration 4) with a note reminding clients of the importance of reviewing their Part D drug coverage or Medicare Advantage plan for the coming year. Looking for more ideas on how to use Medicare to improve your business?Contact i65. We have marketing professionals with expertise to help you. Don't have your custom marketing materials yet?Click here to submit your logo and contact information and we'll get started on customizing your marketing pieces. Newer PostA New Medicare Basics Presentation — With a Hook!